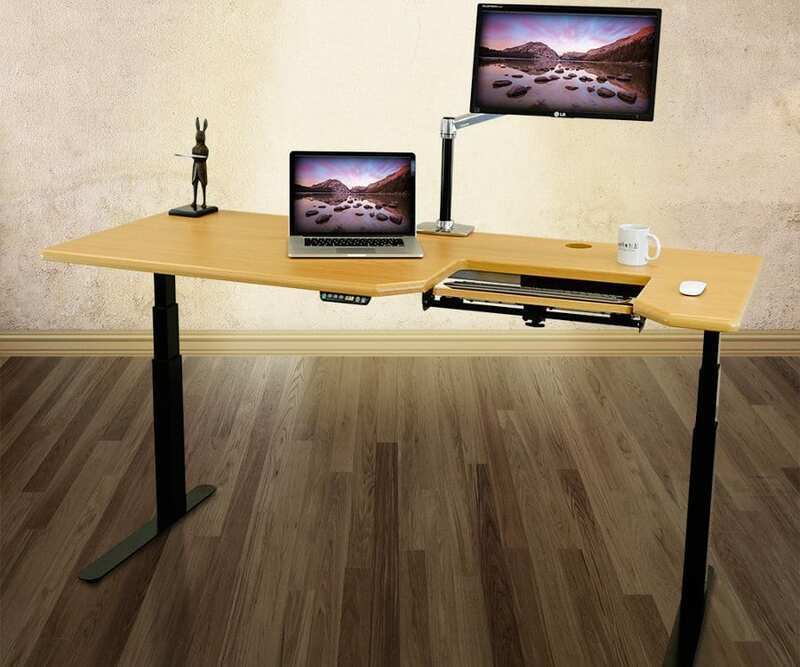 Home » Office Equipment » Standing Desks » The 8 Varidesk Alternatives That Are Cheaper & Better! The 8 Varidesk Alternatives That Are Cheaper & Better! 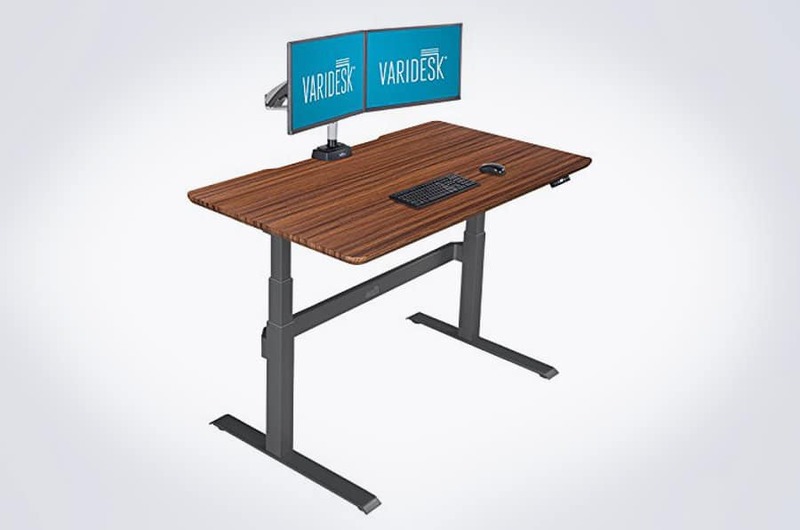 Varidesk has received thousands of happy reviews from its users over the years, and many people seem to be more than happy with the ergonomic standing desks developed by this brand. 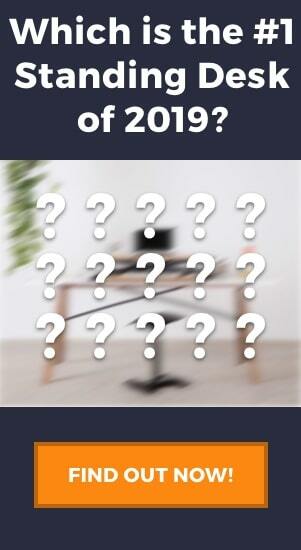 This being said, there are also many people who feel that they are no longer the best brand in the game, and are beginning to look for Varidesk alternatives that are cheaper, that function better, and that more stable and well-built. 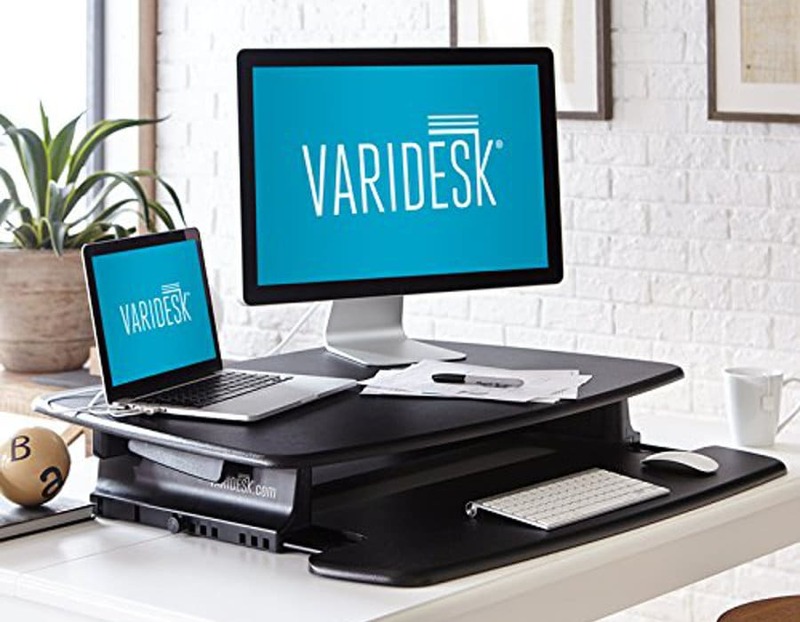 As many people may already know, Varidesk is considered one of the best standing desk brands on the market. Not only were they one of the first, developing ergonomic office health solutions such as height adjustable desks, standing desk converters, anti-fatigue mats, and other accessories, they also continue to produce high quality and effective products. 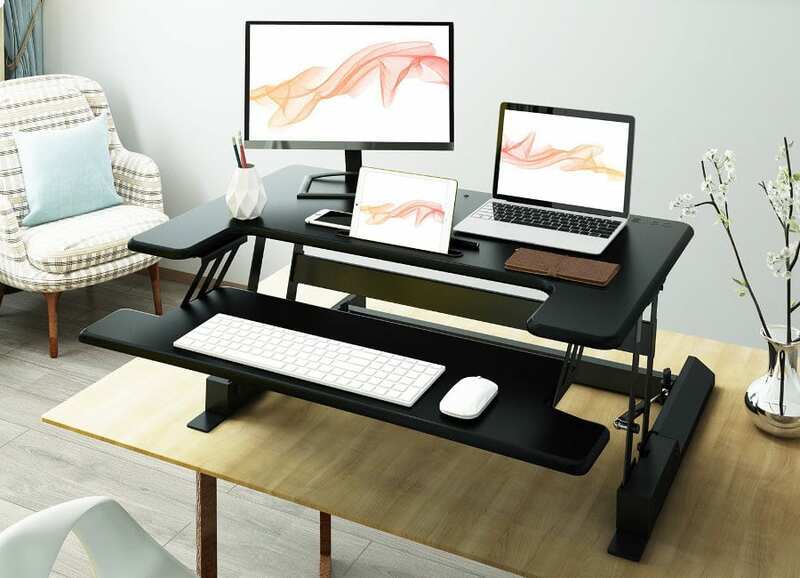 We have chosen four of Varidesk’s most popular products (all standing desk solutions of some kind), to see what it is that they have neglected, and what products out there do a better job. So the products we will look at are the Varidesk Laptop 30, the Varidesk ProDesk 60 Electric, the Varidesk Pro 30, and the Varidesk Pro Plus 36. As the name suggests, the Laptop 30 is a small product that is designed purely for laptop use. This product is great for its simple design, portability, and the ability to transform any surface into a standing laptop desk. We have a couple of gripes with the Laptop 30 however which include its price and its adjustability. It is far from a bad product, in fact, we rate it quite highly in our in-depth review, but we do realize that there may be some better alternatives out there. The AOOU Adjustable Height Laptop Stand is a great product for a number of reasons, but most of all you can’t argue with that price. If you are looking for a compact, portable, and quick solution to get your laptop elevated, then this product is a good choice for you. Despite being the cheaper product, this adjustable laptop workstation boasts a pretty impressive height range. It can obviously be compacted down to under an inch from your desk, and at full extension, it can reach 18″ above your desk surface. This is also with the tray lying flat. If you want an extra few inches of screen height you can go one step further and tilt the tray which will provide close to an extra 4″ in height. Compare this to the Laptop 30 which has an extended height of 15″ and you can see already why this product is a good cheap alternative. The separate mouse tray is a nice addition for those who don’t like to use the track pad on their laptops. We wouldn’t say this is necessarily better than the Varidesk, just a different way of achieving a similar goal. The Varidesk Laptop 30 has a larger surface area to place both the laptop and the mouse, whereas this product is smaller and has the mouse off to the side. What we do like is that it allows you to adjust the angle of the laptop tray without affecting your mouse movement, unlike a single platform which can only be maintained in a flat position. This is where this product really excels, in the fact that it is small, compact, lightweight, and portable. 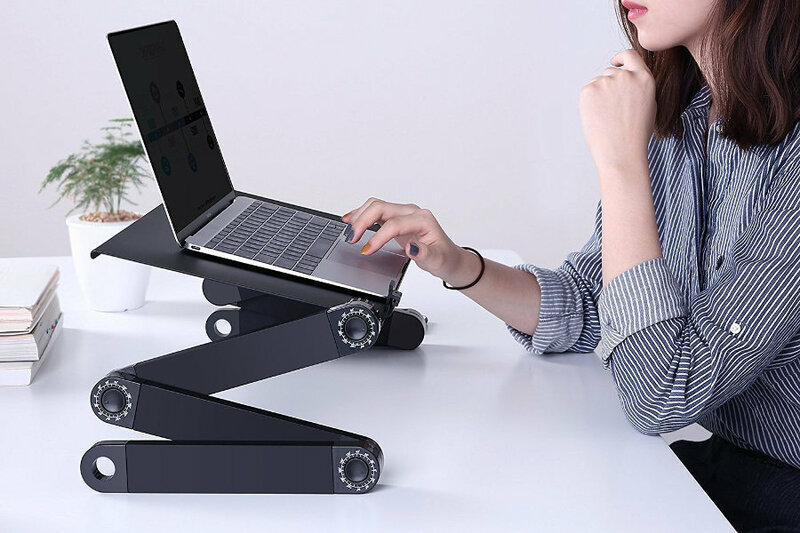 In our opinion, if you’re looking to buy a laptop stand and not a standing desk converter, you’re most likely looking for something portable. The AOOU Adjustable Height Laptop Stand weighs only 3.5 lbs and is 11″ x 16.5″ x 1.2″ while compact. Comparing to the Laptop 30 which is 17.25 lbs and 33.6″ x 18.9″ x 2.9″, this product is by far a more portable option. An interesting addition to this adjustable laptop workstation is the two built-in cooling fans. Anyone who runs a laptop would know that excessive use, as well as poor ventilation, can cause it to run slow and lag considerably. Cooling fans are great at maintaining a better temperature of the laptop and ensure that it works more efficiently. The AOOU laptop table has 3 hinge points with full 360-degree mobility. This allows you to be very versatile in terms of the height and angle at which you have your laptop. Moreover, since it is so portable it can easily be used in bed, on the couch, or on a desk with absolutely no problems. The TaoTronics Standing Desk Laptop converter is very similar in design and function to the Varidesk, but comes at a much more reasonable price in our opinion. It is a bit smaller and more compact than the Varidesk Laptop 30, and has additional ergonomic features that we really like. This actually weighs around 1 lb more than the Laptop 30, but has a total footprint of 24″ x 16.1″ x 3″, making it quite a lot smaller and therefore a little bit more portable. Again, the best part of a laptop stand is using them anywhere, so a product which is a bit smaller is very useful in our opinion. The lifting capacity of this product is larger than the Laptop 30 by a long margin. 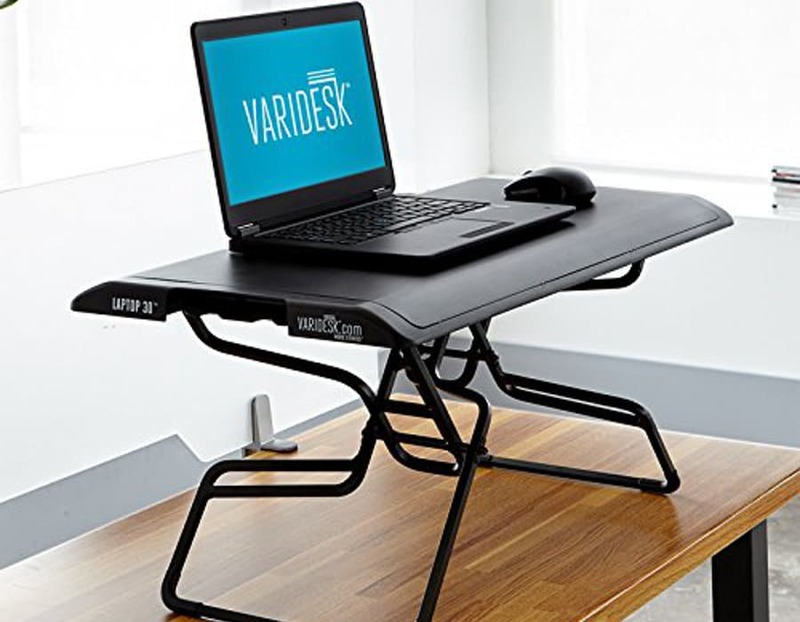 According to the manufacturer, the TaoTronic Standing Laptop Desk can lift and hold around 66 lbs at most, whereas Varidesk recommends to only have up to 15 lbs resting the product. This may not be a deal maker or deal breaker for anyone, but we like this mall feature which makes this product just a little more comfortable. Using a laptop stand, you will find that your wrists sit on the edge of the product which can be a bit of a pain over time. The TaoTronics Desk adds a curved coping to the edge to rest your wrists. The only issue with this feature is that is is not optional as it cannot be removed. An easy way to damage your laptop desk or even your laptop is if you lower the desk too quickly and it bangs against the desk. TaoTronics have included a small padded spring to the bottom of the product in order to counter this and will ensure that you don’t ever bring the laptop tray down too hard against the desk below. It’s hard not to mention the price of this product as a factor, especially since we’ve already looked at the cheaper alternative before. The TaoTronic though, despite being very similar in many functions, and even better in others, costs around 60% of the Varidesk. We must admit, in terms of functionality there are some things that the Varidesk Laptop 30 does better. Both products have the same height range, yet the Varidesk has 9 different height settings as opposed to the TaoTronic’s 5. Varidesk is also a little bit lighter as we mentioned, and when compact will sit closer to the surface (it has a lower profile) which some people prefer. However, given the other features of the TaoTronic which we believe outperform the Varidesk Laptop 30, we think this product is far better value for money. The Varidesk ProDesk 60 Electric is actually one of our favorite electric height adjustable desks. There are many things to like about this product, but that’s not to say that there aren’t also some alternatives. We would consider this product somewhat in the mid to upper range in terms of price and functionality. It is not the most expensive nor the cheapest, and we think there are more functional products than this one, that would come at a higher price tag. Fully standing desk products are all very high quality and definitely are worthwhile products to consider. 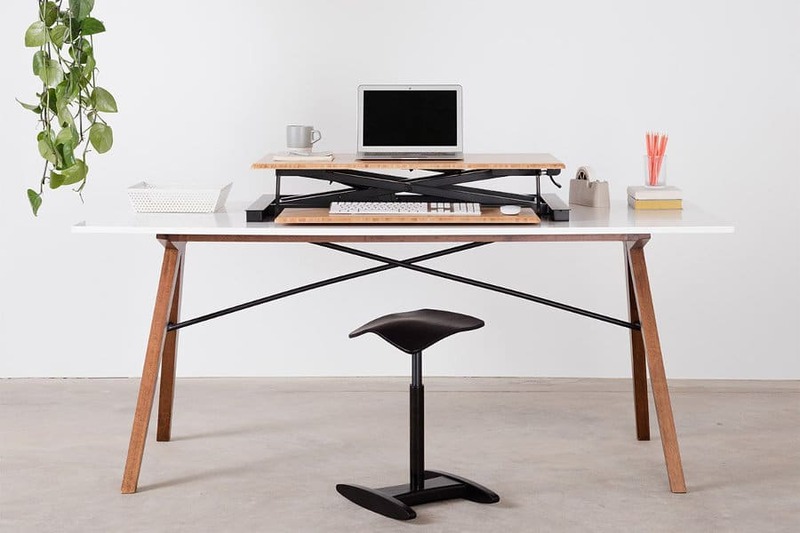 We have done a full breakdown of another one of their products, the Cooper standing desk converter, and the Jarvis is rated by many to be the best height adjustable desk on the market. We believe that the Jarvis and the Varidesk ProDesk 60 are fairly similar in function, so the main separating factor between them is definitely the price. One of the features that the Jarvis is best known for is its incredible adjustable range. This means that almost all users of all heights would be able to use it comfortably without straining their back or neck. The Jarvis has adjustable settings from 24.25″ to 50.25″ (including a 1″ desktop), which is very similar to the ProDesk 60’s 25.5″ to 50.5″ range. 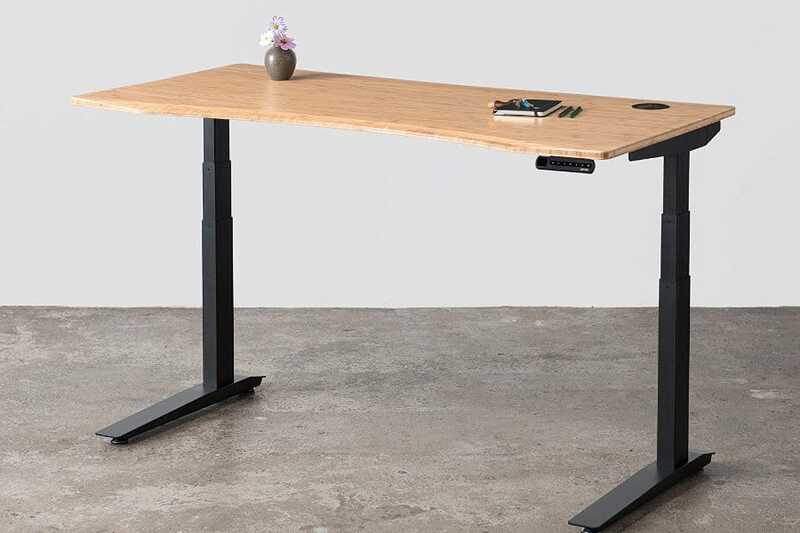 If you take a look at our list of the best height adjustable standing desks (in which all three of these products appear), then you’ll see one thing in common with all: pre-programmable height settings. The best electric desks all have a headset option which allows you to set a number of different height levels. The Jarvis has 4 of these programmable settings, rather than the 3 that Varidesk has. When you buy the Jarvis from the Fully website, you’ll see a large number of options available. You are able to adjust the desktop size, the shape, the materials as well as other options such as better cable management, grommets, and drawers for organization. The ProDesk 60, on the other hand, is just a single product. It only comes in the one 60″ model and all the extras are part of the bundle, meaning they cannot be removed from the final price. One benefit of this is that the price you see is the final price, compared to the Jarvis which can be more or less expensive depending on your needs. The Jarvis has one of the largest lift capacities of any standing desk, with the ability to hold a whopping 350 lbs. We’re not sure that many people are going to have 350 lbs of equipment to place on this desk, but it is comforting to know that the motors are powerful and sturdy. The Varidesk has a pretty good lifting capability as well, but at only 250 lbs it is far lower than the Jarvis. In order to create a stable product, Varidesk has placed a crossbar low down on the frame of this standing desk. 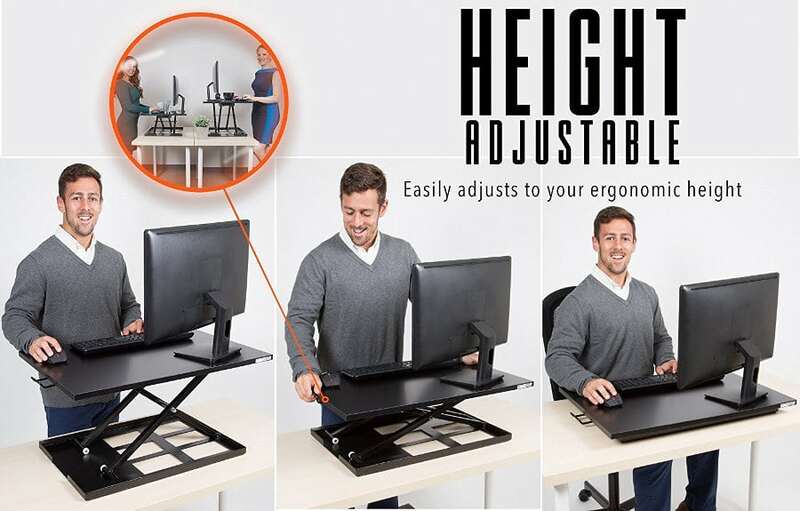 This is great for its lateral stability and will make the product less wobbly, but it is really in the way when it comes to using the desk for other purposes, such as seated work or treadmill desks. The Jarvis has a crossbar that sits directly under the desktop, which some may argue is not as stable as one which is lower down. There aren’t many complaints of instability with this product, only at fully extended heights do people say that the desk will start to shake, and removing the low crossbar is a plus in our opinion. The iMovR Omega Everest is another desk that appears on our list of best height adjustable desks, and it is a crowd pleaser for a number of reasons (to see all those reasons check out our full review here). It is what we would consider a high-end standing desk, as you’ll look to pay over $1000 for this product. The product can be bought through Amazon, although if you want further customization you should really check out the iMovR website. Like the Jarvis, the iMovR Omega Everest is known for its range. In fact, the iMovR, when combined with its additional leg raisers, is the tallest standing desk on the market. The Everest has a range of 26.25″ – 54.5″ (with extenders), which is perfect for tall people. The Omega Everest is a very large unit, spanning up to 83″ wide. It is big and heavy, and this seems to play a large factor in its stability. There are different size options: 60″, 72″ and 83″, which makes it a little more adaptable to different users than the Varidesk ProDesk 60 Electric. This product is well known for being sturdy and strong, and also having very little shaking even at height. Perhaps the most striking difference between the two desks is the built-in ergonomic keyboard tray. The keyboard tray is the best feature of the Everest in our opinion, as it allows you to angle your keyboard at a different angle to the desk, which takes pressure off your wrist and hands while typing. Anyone who spends hours a day typing at a computer will know the amount of stress this causes over time, and this style of keyboard tray would be sure to help you out. Overall we believe the product is of a higher quality than the Varidesk ProDesk 60. Firstly, the motor is much quieter, only making 46 dB of noise when in motion. The Varidesk, on the other hand, makes up to 60 dB, which although is not too loud itself, makes a difference when in an office setting. Additionally, the laminate desktops of the iMovR products are constructed in a special way, one which they call 3D laminate technology. This laminate is reported to be much more resistant and also aesthetically pleasing. The Varidesk Pro 30 is actually our least favorite Varidesk product and we only gave it 1.5/5 stars in our previous review. Despite a lot of positive reviews, we believe there are a number of reasons to no like this product, and we think there are plenty of better desk converter alternatives for you to consider. Straight off the bat, we must say that one of the main reasons we didn’t like the Varidesk Pro 30 was due to the single platform build. A lot of modern standing desk converters opt for dual platforms to have a separate keyboard tray, unlike the Varidesk Pro 30. We thought in this instance it was best to compare like with like, because the X-Elite Pro also is a single platform desk converter. There are many positive qualities about the X-Elite Pro, notwithstanding a really affordable entry-level price. Standing desk converters come in a number of styles, this includes the construction of the frame. A z-frame such as the Varidesk Pro 30 is not ideal mainly due to the fact that when it rises up, it also moves out towards the user, occupying much more space. The X-Elite Pro has an x-frame which means that it will lift directly vertically and not outwards, which makes the product more compact and better for tighter spaces. If you’re looking to get a smaller desk converter such as the Varidesk Pro 30, then you might be interested in an even more compact product like the X-Elite Pro. This product is 2″ narrower and 6″ less deep than the Varidesk and it also only weighs 27 lbs compared to 42 lbs. Although this is a benefit in our eyes having a more compact unit, you must take into account that the Varidesk does have more lifting capacity than the X-Elite Pro, so if you have large monitors this may be an issue. 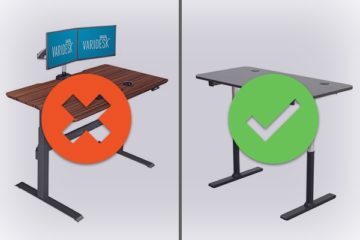 Neither the X-Elite Pro nor the Varidesk Pro 30 have a great adjustable range when compared to other products, but it is interesting to note that the X-Elite Pro has in fact 0.5″ greater max height than the Varidesk, and this is coming from a product that is under half the price! Probably the best feature of the X-Elite Pro is the adjustability of the levels. In fact, unlike the Varidesk it doesn’t have levels at all. The Varidesk standing desk converter has 11 different height levels from which to choose, whereas this alternative has a smooth lifting mechanism. This smooth mechanism means that at any point between compact and max-height (16″ for this product), you can set the desk height. 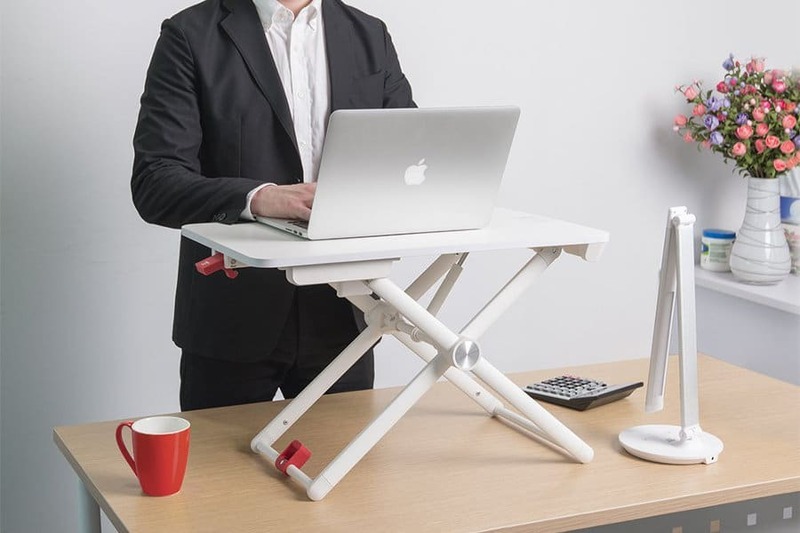 This allows for better ergonomics and being more selective with your desk height. 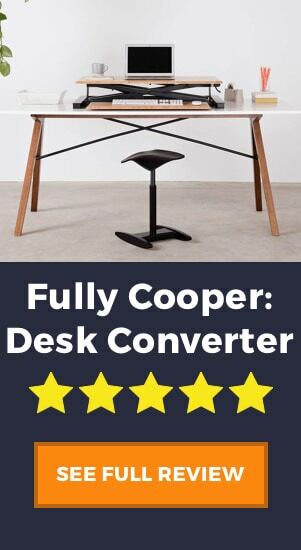 The Fully Cooper is a fantastic product and really much better than the Varidesk Pro 30 in our opinion. We have included this product is our Best Standing Converters of 2019, as it really has proven to be one of the sturdiest, most functional, and most reliable standing desk converter on the market. Like the X-Elite Pro, the Fully Cooper uses the x-frame design. It has a much more compact lifting area, lifting vertically rather than towards the user. Also similar to the X-Elite Pro is the fact that the Cooper glides up and down and has infinite height adjustment. There are no set levels so you can get put the desk at the perfect height for you. The Cooper is arguably the best standing desk converter for tall people. The adjustable range starts at 8″ while compacted, and rises to 22″ at full extension. Although some people prefer a desk with a lower profile, we think that the 22″ max-extension is tough to beat, and taller users out there would love this product. On the Fully website, it is possible to select from either bamboo or laminate for the desktop finish. We love the bamboo desktop finishes not only for their aesthetically pleasing design but also for the quality and eco-friendly nature of the product. Bamboo is a strong wood which is resistant to scratches, dents, and water damage. Moreover, it is one of the world’s most sustainable building materials, which is a definite bonus in our eyes. Unlike the other Varidesk alternative, we decided to pick one that didn’t have just the one monitor surface. As we mentioned before, we really see a single surface as a drawback when there are plenty of products with the more ergonomic two-tier design. The keyboard tray on the Cooper is not adjustable independently of the monitor surface, but it is large and can accommodate a keyboard and a mouse comfortably. It also frees up a lot of space on the actual desktop for those who need the extra room. Again it seems we have found a product that not only is better than the Varidesk model but also is cheaper. It’s not often that you find a product that is such great value for money. The Cooper has a number of great features, a great adjustable range, quality material, an ergonomic design, and most importantly it receives great reviews from its users, so we believe that the Cooper is truly a great deal. If you’d like to see more we did a full product review of the Cooper here. As you can see from the star rating below, the Varidesk Pro Plus 36 is far from a bad product. We even include it in our list of best standing desk converters. This being said, like a lot of Varidesk products, it is quite expensive. There are many other similar standing desk converters which achieve similar results (or even better results!) for cheaper. We have identified two products that are fairly comparable is style, size, and function to the Pro Plus 36, and we believe if you are looking for a Varidesk alternative then one of these is sure to be right for you. The Fezibo has a similar design and very similar proportions to the Varidesk Pro Plus 36. The products have the same z-frame lifting mechanism, similar keyboard cutout, and the shape and dimensions of the monitor surface are almost identical. This product costs under half the price! The first thing to note is that the Fezibo has a removable keyboard tray, meaning that users who don’t like to use a tray can move it out the way when they work. Although we always say that having a tray is better for ergonomic purposes, we do like products that give their users more options. Note that it is not an adjustable keyboard tray, as when it is in position, it is fixed. Like some Varidesk products, the Fezibo comes in two different sizes, either the 36″ model or a smaller 29″ model. 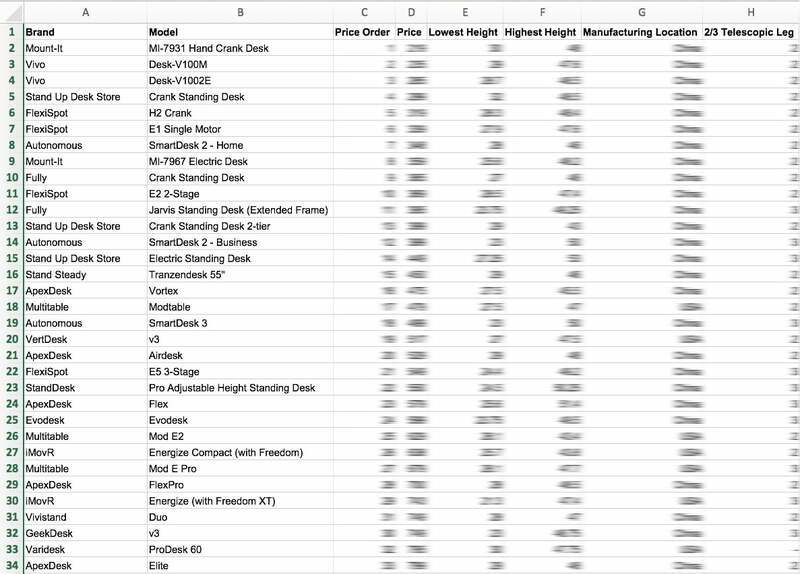 The best part is, the 29″ model is even cheaper! Multiple model sizes are not that common among cheap standing desk converters, so we are very impressed that Fezibo offers this to their users. Despite the low price, the Fezibo certainly hasn’t suffered when it comes to quality. The materials and the build are both decent quality and in terms of sturdiness its users give great feedback. One issue is that it doesn’t quite have the same range as the Varidesk (about an inch less), and it only has 8 height levels as opposed to 11. 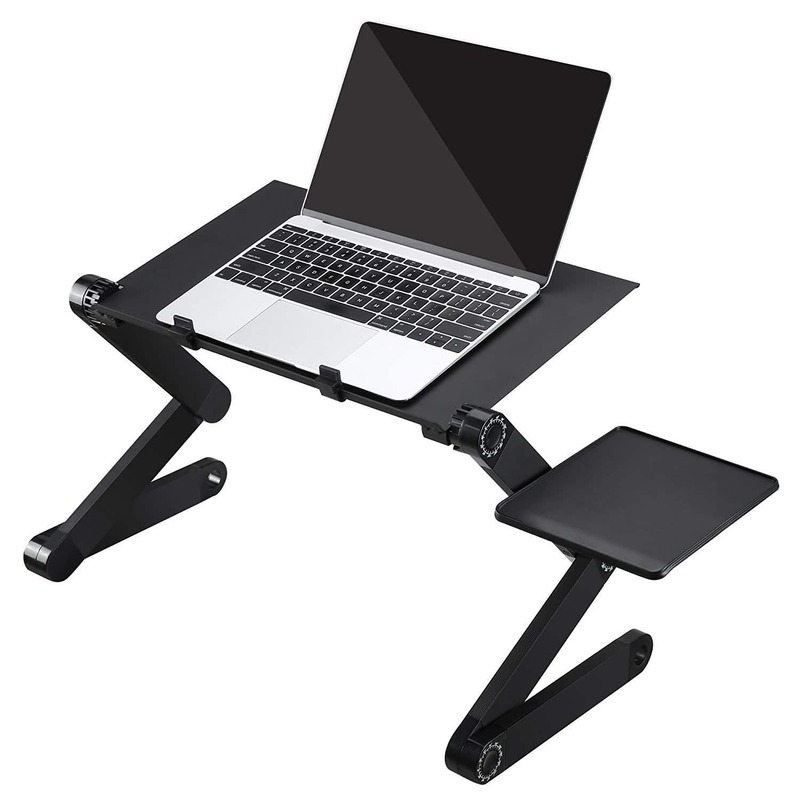 We believe that the Fezibo might be one of the best standing desk converters under $200! For this quality in terms of design, build, and functionality, it really comes at an affordable price. We don’t believe that this desk is better than the Varidesk and would admit that the Varidesk outperforms it slightly in most areas, however for that slight improvement in the product you have to pay over twice as much. So in terms of the cost-benefit ratio, we think the Fezibo takes the prize here! Another contender for our standing desk converter of the year, the FlexiSpot M2B is rated very closely to the Varidesk. We’ll take a look at some of the features which we believe makes this product a great alternative for the Varidesk Pro Plus 36. We mention time and time again the importance of an x-frame design. Despite some issues that some people find with certain “pinch-points” in this design, we feel that the benefits much outweigh this issue. An x-frame offers vertical lift without occupying more space in your office, and some would argue that an x-frame is more stable too since the bulk of the weight is centered above the unit. For a small desk converter, the M2B has an impressive range. It rises up to 19.7″ at full extension, making it a good option even for tall people. Although it does not have infinite locking positions like the Cooper and other stand up desk converters, it does have 12 locking height levels, making it fairly versatile. 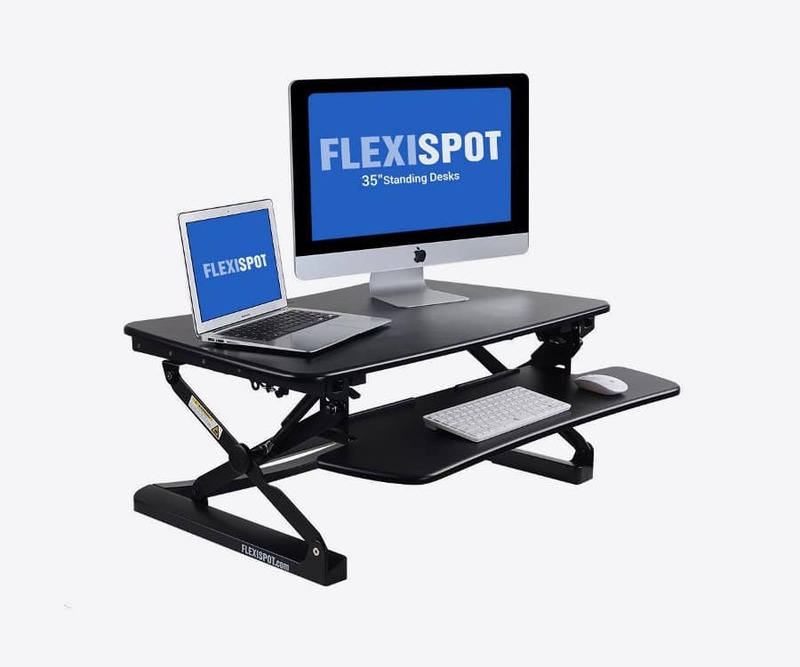 The FlexiSpot M2B is designed differently to other desk converters in that the upper desk surface does not have a cutout in order to fit the keyboard tray. This means that both surfaces, the monitor surface, and the keyboard tray have an overall greater surface area and more space for keyboards, monitors, mouse and more. The last improvement which we see between the FlexiSpot and the Varidesk it the easy vertical adjustments. The FlexiSpot M2B has a single lever in order to move the desktop up and down, so you are even able to do so single-handedly. The powerful lifting mechanism makes this easy so that it requires almost no force to move in and out of positions. Varidesk alternatives come in different shapes and sizes, and as always what fits one person might not always be right for another. What we do hope is that you realize that despite being a well-known brand in the industry, Varidesk products don’t come without their faults, as not every product can be perfect in every way. Among all these products we hope you can sift through the information to find a solution that suits your needs, whether it be a more stable desk, a cheaper one, taller, or more customizable. The choice is yours!